We have been learning about US Symbols in Social Studies. 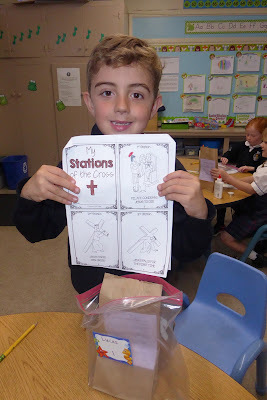 We read about a different US symbol each day. Then, we make an anchor chart with facts from the book we read. Finally, we color a page in our US symbols coloring packet. I am currently taking a class about inclusive education and I have been learning about Universal Design for Learning. 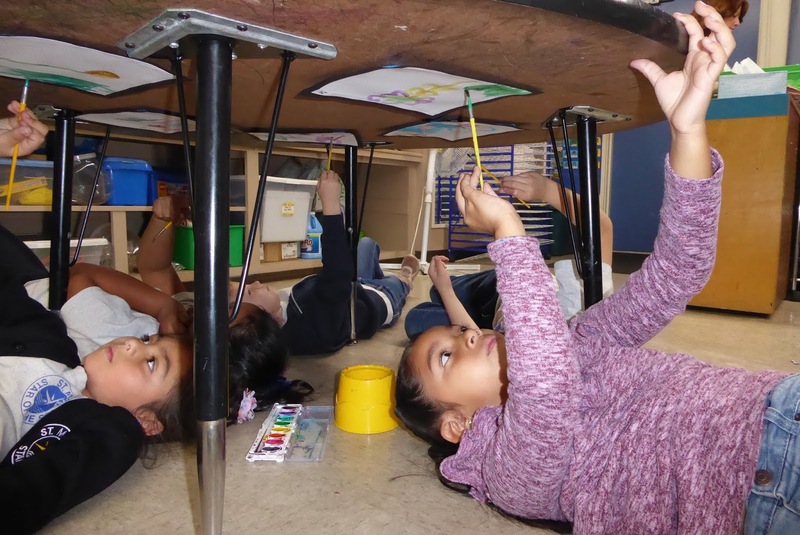 I have been thinking about using flexible seating in my classroom for the last three years. I tried it with a group of kids I had three years ago and it was a disaster; the kids fought over who got to sit where and I did not have a lot of options for where the kids got to sit. After a week, I gave up because it was too hard. 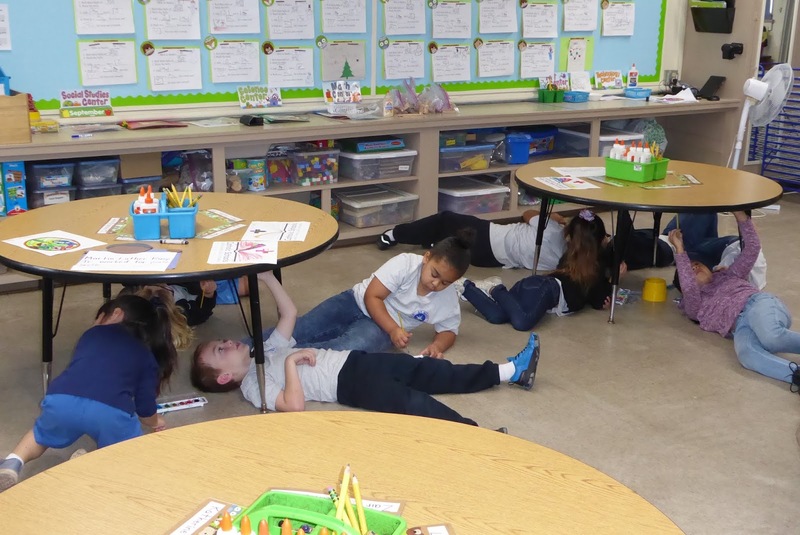 Since then, I have seen a few teachers use flexible seating and it worked for their kids. So, I decided to try it again. I raised two of my tables to be belly desks. 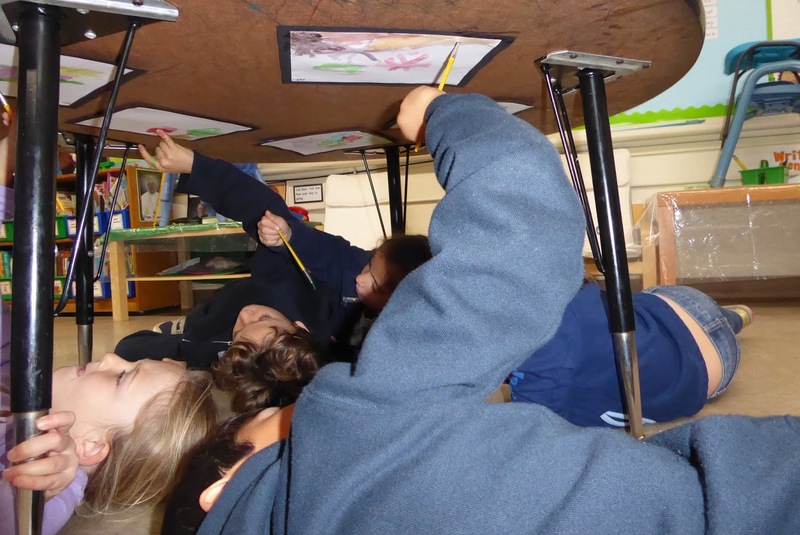 I lowered (took the legs off) two of my tables so that kids can sit on the floor, and I left two tables at the normal height. Here is a picture of my kids working. In this picture you can see one belly table, one regular height table with stability balls as chairs, and one low table with cushions. Here is one of my students using the stability ball. This little guy is at the low table and is sitting on a cushion. These two kids are at the belly table. This is the carpet area. I teach most of my lessons from this carpet and then the kids go back to their tables for independent practice. I got clipboards for my kids to use when they are on the carpet. Here are my little ones working. They are starting to understand what seating works for them. I also got fidgets at the Dollar Tree. 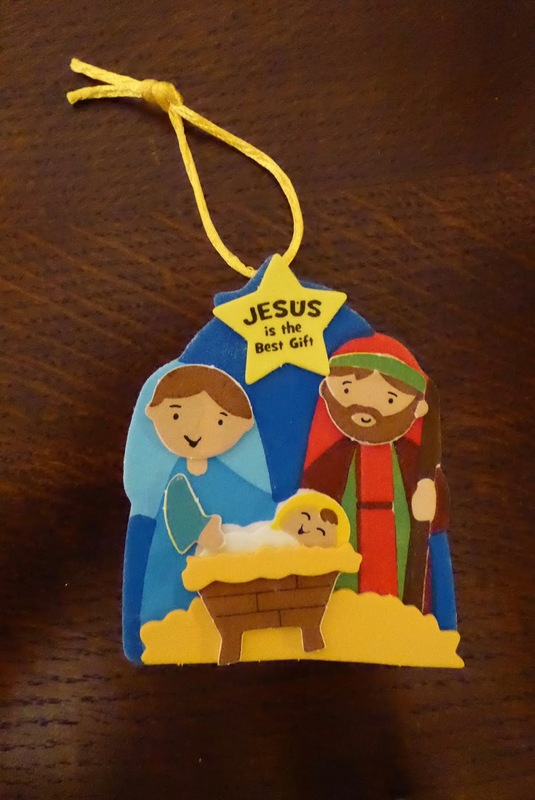 There are enough for all of the kids to have one it they choose to. I had to teach the kids how to use fidgets appropriately and they understand that if they misuse the fidgets, then they have to put them back. I made a cool down corner. This is still a work in progress. 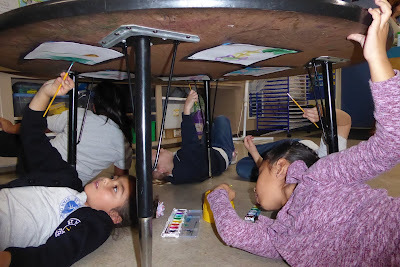 I need to get a timer, a few calming sensory bottles, and crayons and paper so the kids can draw how they feel. 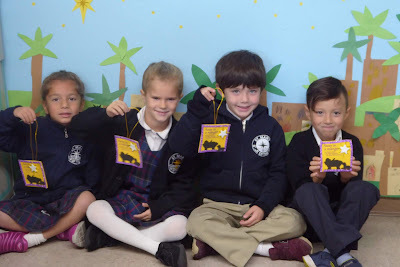 Today we did several activities about rainbows. First, we learned about rainbows. 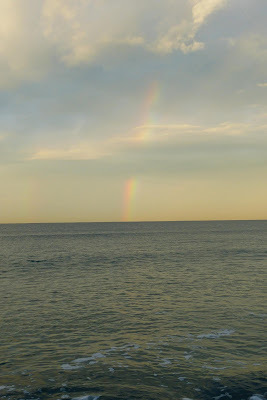 The kids chose a way to learn about rainbows. They could choose to listen to songs about rainbows, read information about rainbows, or watch videos about rainbows. The eighth grade girls came to help us with this lesson. This is a picture of some of the eighth grade girls reading books about rainbows to the kids. The kids in this picture chose to watch informational videos about how rainbows are formed. The kids in this group chose to sing songs about how rainbows are formed. 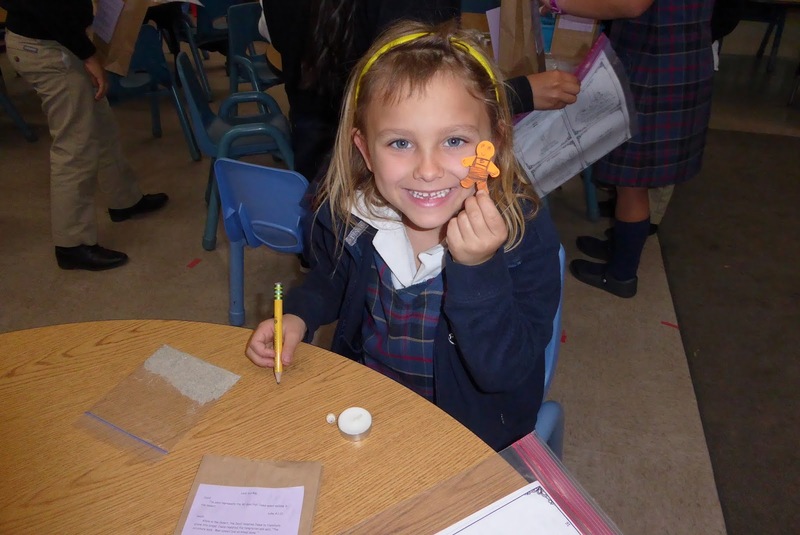 Next, we did activities about rainbows. The kids could chose from making a rainbow in a cup, making a walking rainbow, or making a fizzing rainbow. This picture is of kids making a rainbow in a cup. We used hair gel and liquid water colors. This is a child working on making a walking rainbow. This is one hour after making the walking rainbow. 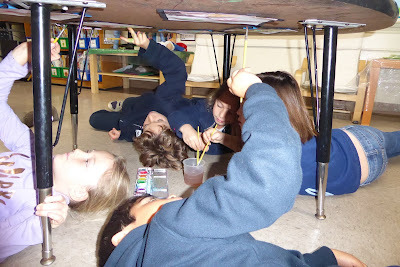 This is the kids making fizzing rainbows. We used baking soda, food coloring, and vinegar. We had to do the fizzing rainbow again with the whole class because it was so fun! 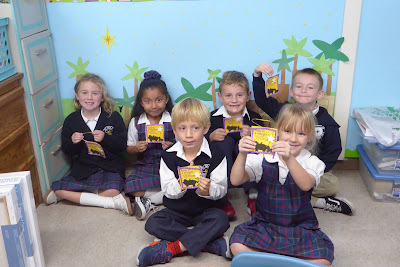 We had a lot of fun learning about rainbows. The Kindergarten, first grade, and second grade students had a retreat to learn more about Lent. 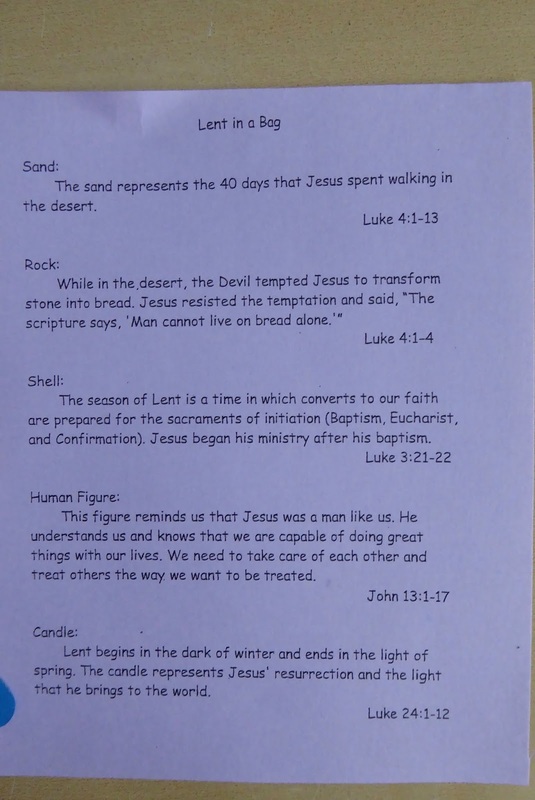 The teachers put the kids into three mixed age groups and then the kids rotated to each classroom to do a different activity about Lent. 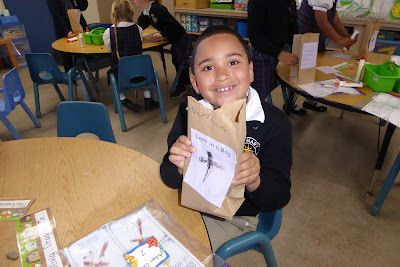 In my room, the kids made "Lent in a Bag." 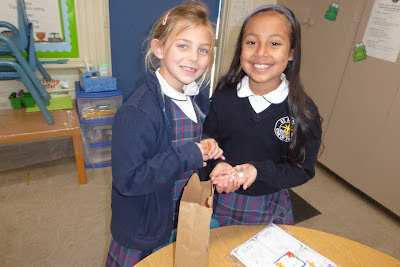 The kids put different items in the bag that symbolize something that happens during Lent. In the second grade room, the kids learned about the Stations of the Cross. In the first grade room, the kids learned about the three pillars of Lent: prayer, fasting, and almsgiving (activity not pictured). 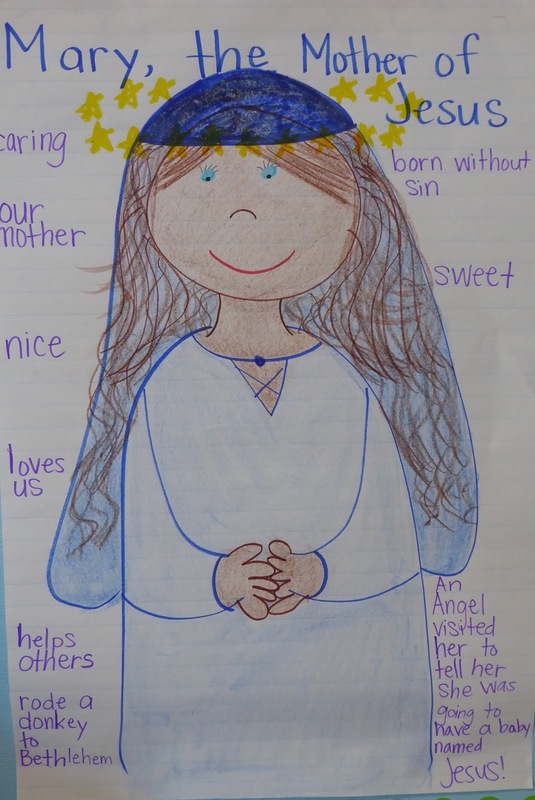 Last week, we learned about Michelangelo. Michelangelo painted the roof of the Sistine Chapel. So, today we painted under the table like we were painting the roof of the Sistine Chapel. The kids had so much fun. On November 30, the Kindergarten, first grade, and second grade classes had an Advent retreat. 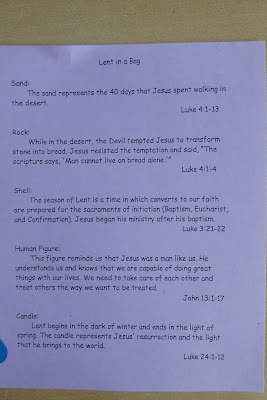 We divided the kids into mixed grade level groups and then each group rotated to three classrooms to learn about Advent. 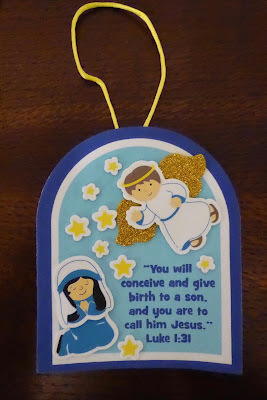 We learned about the Holy Family, the Annunciation, and about Advent in general. We talked about Advent wreaths too. 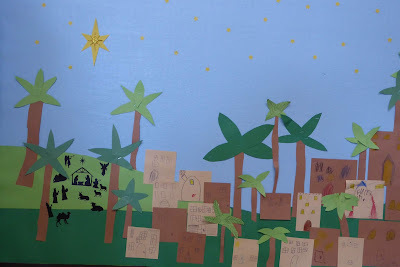 The kids in my room also helped make this bulletin board display of Bethlehem. 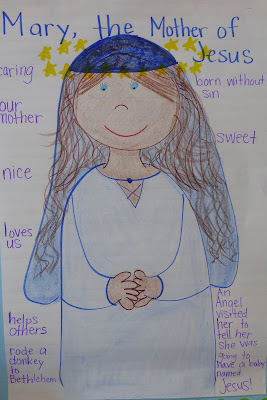 Last week, my class learned about Mary. 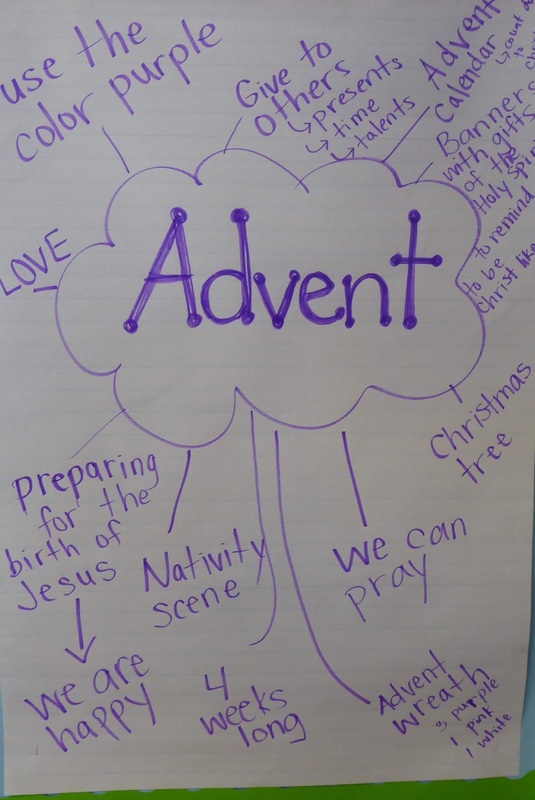 Here is an anchor chart that we made. We also made these cute crafts from the Oriental Trading Company. We had a wonderful time learning about Advent. 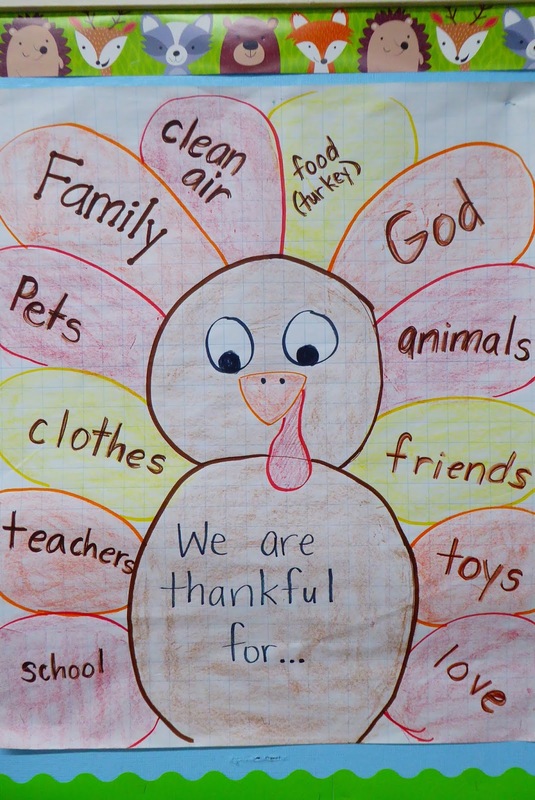 I know this post is a month late, but here is a cute anchor chart that my kids and I made about what we are thankful for. 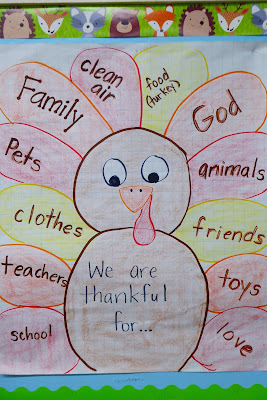 We are also thankful for rain. 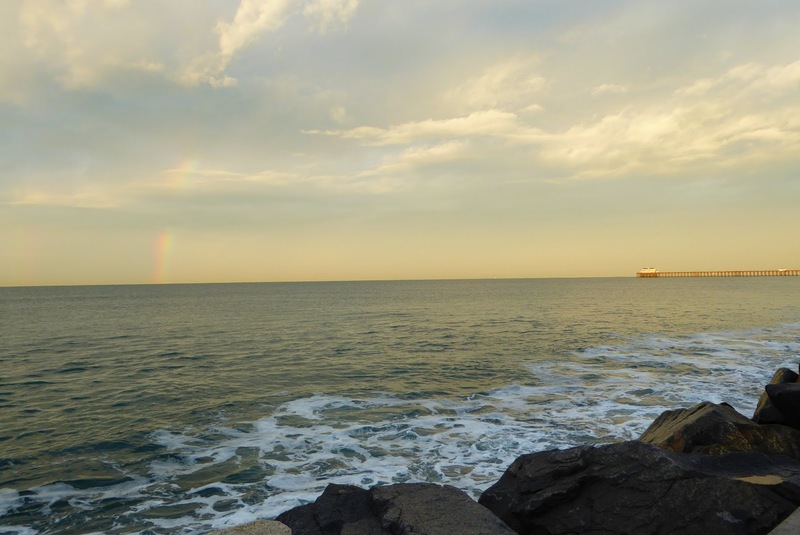 It rained last week and we saw a beautiful rainbow. Rainbows remind us of God's promise to always be there for us when we need him.